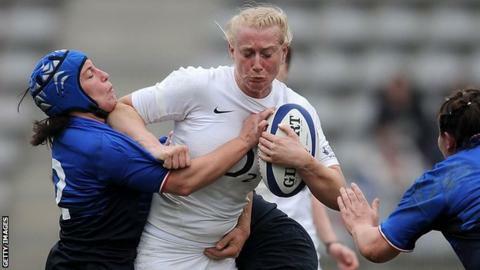 Tamara Taylor will captain England women during the Six Nations. Taylor, 33, the Darlington second row, has been capped 78 times and played at three World Cups, including every match of the 2014 triumph in France. She will captain England in the absence of Katy McLean, who has been named in the sevens squad for the Brazil leg of the World Series in February. Nicky Pondsford becomes acting head coach following Gary Street's departure on Monday after eight years in charge. England begin their Six Nations campaign without a number of the players who helped them win the World Cup. Rugby sevens will be included at the Olympics for the first time in 2016, and England have been chosen as Great Britain's representatives for the Rio 2016 qualification process. "Tamara Taylor will be popular choice as captain with the players. With England rebuilding and the sevens squad in Brazil, the coaches will look to her lead an inexperienced side against Wales. The coaches have explained they'll review the captaincy after each game with Katy McLean remaining England captain in the long run. But her fly-half duties with sevens may prevent her having a significant role in this Six Nations." The Brazil leg of the World Rugby Sevens Series takes places on 7-8 February and clashes with England's Six Nations opener away to Wales on 8 February. To qualify for the Games England, who gave 20 players professional contracts this summer, must finish in the top four of the World Rugby Sevens Series which is staged over six venues. Taylor says she is honoured to be handed the England captaincy and does not want her team-mates to rest on their laurels following the World Cup success. "To captain any team is a privilege, and to captain England is the highest level you can go," she told BBC Sport. "I'm really looking forward to the challenges ahead. It's a new era for England despite winning the World Cup we need to start again."